Some dates for your 2018 diary. We are now accepting 2018 Bookings that include “Seven days of accommodation plus discounted Fishing” noting all 2018 Apartment Availability can be seen via our website at https://www.manor-fisheries.co.uk/availability/ . If you require to know the availability of fishing during 2018, call 01622 890 990. The 2018 Night Member is available via our web site. From the 1st November 2017 we will be accepting Bookings dated the 1st November 2017 onwards, that include both “Accommodation and discounted Fishing” for 3, 4 or 7 days or longer. From the 15th January 2018 we will be accepting Bookings dated the 15th January 2018 onwards, for fishing from 2018 Night Members (who can book ahead up to month six) but must be a registered 2018 Night Member. From the 15th February 2018 we will be accepting Bookings from the general Public requiring only Day Fishing (7.00 am to 7.00 pm) who can book ahead up to month three. Throughout August the Lake 2 Cats continued to show up in record numbers, and especially at night. Anglers (a maximum of up to 4 per day) have for the first time broken the “100 barrier” by catching and recording during August 100 x 30lbs+ Cats to a 41lbs 8ozs specimen landed by Daniel Selby; his Lake 2 Cat PB and his 2nd PIN; adding it to his 2016 PIN for an 8lbs Bream. During late August the Lake 1 Carp also showed up in good numbers and 5 x 20’s Carp were landed. The heaviest was a Mirror weighing 23lbs 2ozs caught by Spencer Hart. Thank you to all those anglers who have spent a few moments to summarise their catch in the Cabin Log Book. This information forms the basis of our Monthly Report to keep anglers informed of what has happened. Regular Dave Kendrick returned on the 1st August and landed Commons weighing 16lbs 8ozs and 4lbs. Regulars Steve Hyder and Terry Keard arrived on the 1st August for a 48 hour session to experience heavy rains and strong winds with a little sunshine. Terry landed a 14lbs 4ozs Common and a 9lbs 8ozs Mirror while Steve landed Commons weighing 14lbs 1oz, 8lbs 12ozs and 2 x 8lbs 8ozs plus Mirrors of 9lbs 10ozs and 9lbs 8ozs. Visiting on the 4th August, David West landed 7 x Carp including Commons weighing 18lbs, 15lbs, 14lbs, 13lbs and 11lbs plus Mirrors weighing 13lbs and 12lbs. Ian Emms returned on the 9th August and landed 18 x Carp during his 48 session including 15 x Commons to 16lbs 9ozs (11 x doubles) and Mirrors weighing 14lbs 15ozs, 10lbs 20zs and 8lbs 9ozs where the successful bait was Urban Baits 18mm red and spicy fish boilies. Will Timson returned on the 11th August when he landed 7 x Carp including Mirrors weighing 18lbs, 12lbs and 11lbs plus Commons weighing 16lbs and 12lbs plus two under 10lbs. Visiting on the 17th August Eric Ng landed a 10lbs Carp. Gordon Lindsay visited on the 18th August and landed 7 x Carp including Commons weighing 15lbs 8ozs, 14lbs 5ozs, 11lbs 6ozs and 10lbs 9ozs plus Mirrors weighing 16lbs 4ozs, 10lbs 14ozs and 9lbs 8ozs. Arriving on the 19th August for their 36 hour session, Lee Bridges landed 10 x Carp including Commons weighing 15lbs 8ozs, 14lbs, 13lbs, 11lbs and 10lbs plus Mirrors weighing 17lbs, 16lbs, 15lbs 8ozs, 12lbs and 9lbs. During this session colleague Chris Timson landed 7 x Carp weighing from 8lbs to 12lbs while Will Timson used Sticky Krill boilies to catch 20 x Carp that included Commons weighing 2 x 15lbs, 2 x 12lbs, 2 x 11lbs, 10lbs, 9lbs, 8lbs, 2 x 7lbs and 5lbs plus Mirrors weighing 18lbs 15ozs, 17lbs, 2 x 16lbs, 12lbs, 11lbs, 10lbs and 8lbs. Colleague Terry Bowdery landed 16 x Carp weighing from 10lbs to 17lbs. Regular David Hodge returned on the 23rd August and landed a 10lbs 8ozs Common while colleagues Charlie King landed a 18lbs 8ozs Mirror and D King landed Mirrors weighing 19lbs 4ozs and 10lbs plus a 16lbs Common. Arriving on the 23rd August, regular Paul Kitt used white pop-ups during his 24 hour session to land Commons weighing 16lbs 4ozs, 15lbs, 13lbs 6ozs, 10lbs, 9lbs 8ozs, 8lbs 6ozs plus a 7lbs Mirror. Regular Terry Keard returned on the 22nd August and used Krill boilies during his 48 hour session to catch 11 x Carp including Commons weighing 14lbs 15ozs, 14lbs 6ozs, 13lbs 8ozs, 13lbs 6ozs, 12lbs 2ozs, 11lbs 14ozs, 10lbs 8ozs, 10lbs 6ozs and 8lbs 7ozs plus Mirrors weighing 10lbs 1oz and 9lbs 6ozs. Spencer Hart began his 48 hour session on the 25th August and had a great 32 x Carp catch averaging 16lbs each; including 3 x 20’s to a 23lbs 2ozs Mirror with the smallest Carp weighing 11lbs. Returning on the 28th August, Keith Richards used nut flavoured boilies and raised his Carp PB to 22lbs when his catch included 15 x Carp with 13 over 10lbs+. Regular Roy Prout returned on the 1st August and landed Cats weighing 30lbs 30zs, 26lbs 1oz and 23lbs 13ozs. Rob Bates and David Platt arrived on the 1st August to begin their 24 hour session. Rob landed 3 x Cats weighing 25lbs, 23lbs and 22lbs while David had 6 x Cats weighing 2 x 35lbs, 30lbs, 25lbs and 2 x 20lbs. First time visitors James Purton plus 3 colleagues visited on the 4th August to target the Cats using double halibut pellet bait. Although two large Cats were lost, Cats landed weighed 35lbs, 31lbs 8ozs, 27lbs 10ozs and 17lbs 8ozs plus a small Carp. Regular John Bairam returned on the 7th August and landed Cats weighing 34lbs 12ozs, 26lbs 8ozs and 22lbs 3ozs and again on the 28th August when John landed Cats weighing 22lbs 5ozs and 20lbs 10ozs. With unsettled weather forecast, regular Paul Coombes returned on the 7th August to begin his 60 hour session when he landed 8 x Cats weighing 37lbs, 31lbs, 29lbs 8ozs, 24lbs, 22lbs 8ozs, 2 x 21lbs and 15lbs 8ozs. Arriving on the 9th August, Bill Ellis enjoyed a great 24 hour session when he landed 17 x Cats including 7 x 30’s and weighing a total of 469lbs: 35lbs 8ozs, 35lbs, 2 x 34lbs 8ozs, 34lbs, 32lbs 8ozs, 30lbs 2ozs, 28lbs 12ozs, 28lbs 8ozs, 27lbs 10ozs, 26lbs 4ozs, 24lbs, 23lbs 4ozs, 23lbs, 22lbs 5ozs, 21lbs 12ozs and 7lbs. Regular Gary Day visited on the 10th August and landed 6 x Cats weighing 29lbs, 27lbs 4ozs, 26lbs, 25lbs 2ozs, 13lbs and 11lbs plus a 15lbs Common. After a slow start on the 11th August, regular Tony Payne landed Cats weighing 30lbs 8ozs and 15lbs 4ozs with halibut pellet the successful bait. 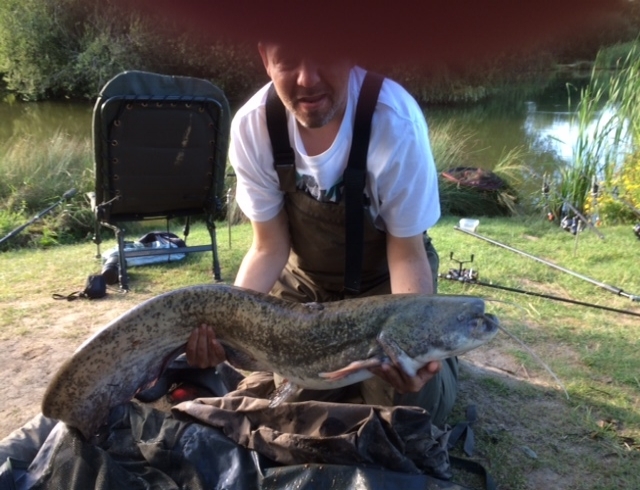 Using 20mm halibut pellets on the 15th August, Nicholas Flood landed Cats weighing 34lbs 5ozs and 29lbs 7ozs. Paul Hounsell together with George Hind, Richard Hounsell and Darren Epps, arrived on the 12th August for a short break. As can be seen below, the Cats were feeding well when all four achieved new PB’s. Their combined catch included 1 x 40+ plus 17 x 30’s. Of particular note is the 33lbs 8ozs PB Cat caught by Richard who set a new lake record for a blind angler. Returning on the 15th August regular Peter Parsons landed Cats weighing 28lbs and 22lbs 5ozs and again on the 29th August a 16lbs Cat. Bob McGregor and his son Ben arrived for a short break on the 19th August and next day began targeting the Cats. During the next 5 days, and especially during the night, they landed 48 x Cats to 36lbs 50zs including 10x 30’s and mostly high 20’s. During this period Bob’s long-time friend Bill Phillips ledgered using halibut pellet bait and float fished using leeches for 90 hours to land 41 x Cats weighing a massive 1063lbs; consisting of 1 x 40lbs, 16 x 30’s to 36lbs 8ozs, 15 x 20’s to 29lbs 40zs and 9x kittens to 18lbs. Bill is the founder member of our “1,000 lbs Club” when he originally planned a 96 hours session in May 2011 but needed to “Retire” early after only 68 hours after landing 1,350 lbs of Catfish. Well done Bill and again setting the “1,000 lbs Club” benchmark. Arriving on the 26th August regulars Mark Davis and Dev Hudagverdi targeted the Cats during their 24 hour session Mark landing a Cat weighing 35 lbs and Dev landing 4 x Cats weighing 32lbs, 25lbs, 17lbs and 12lbs. Regular Daniel Selby began his 48 hour session on the 26th August and after a very slow start then connected with a succession of heavy Cats during the night, including weights of 39lbs 8ozs, 38lbs, 37lbs, 33lbs and his Lake 2 PB of 41lbs 8ozs giving an exceptional 5 x Cat average of 37½lbs. On the 27th August Daniel was joined by his brother Jamie who landed a Cat weighing 29lbs 8ozs. Regular Jason Tuckey began his 24 hour session on a hot 29th August and found the Cats very active at night. His catch of 7 x Cats included 4 x 30’s weighing 38lbs 6ozs, 36lbs 4ozs, 35lbs 2ozs and 32lbs plus 2 x 20’s weighing 28lbs 12ozs, 26lbs 10ozs and 23lbs. During continuous rain throughout the day on the 30th August, regular Paul Hutchinson recorded the 100th Lake 2 “30lbs+ Cat” landed this month which weighed 33lbs 2ozs. The successful bait was crab boilie and Paul added a further Cat weighing 28lbs 4ozs plus a 11lbs 10ozs Common to his overall catch. During a short break and atrocious weather on the 31st August, Eric Dumper landed a 20lbs Cat. Returning on the 1st July Jim Hall had a truly mixed bag catching 5 x Tench to 5lbs, 6 x Carp to 5lbs, 3 x Bream to 4lbs and a couple of quality Roach. It was a quiet day on the 7th August for regular Bernard Day who landed a Tench and a Carp. Using 8mm Robin Red boilies on the 15th August, Charlie Flood landed 17 x Carp weighing from 2lbs to 8lbs and 10 x Tench weighing from 1lb to 4lbs. Ian Harvey visited on the 20th August and landed 5 x Carp to 9lbs, 7 x Tench, 5 x sizeable Bream plus numerous Roach and Perch and again on the 27th August when he caught 7 x Carp to 8lbs, 2 x Tench to 2lbs 8ozs, 3 x Bream to 3lbs and many Roach and Perch. During a hot 29th August Steve Sharp caught 3 x Tench to 4lbs, 2 x Commons to 8lbs, a 3lbs Mirror and Roach and Perch. Returning on the 29th August regular Fred Rosier landed Mirrors weighing 7lbs 1oz and 5lbs 13ozs plus 2 x Tench to 1lb 13ozs.